This is a guest post from Chris Hunter. Mr. Hunter is the Editor of www.bikeexif.com: A daily dose of the coolest motorcycles: new and classic cafe racers, customs, production motorbikes, racing motorbikes, and design icons. Subscribe to his site to get your daily dose of two-wheeled manliness. 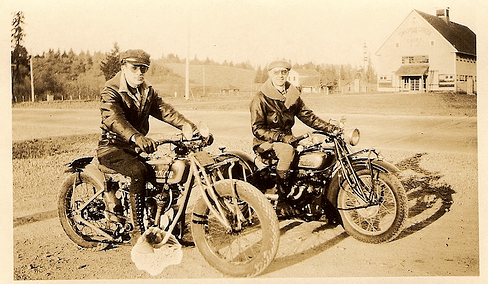 Motorcycles are one of the pinnacles of manliness. They’re up there with Islay single malt, grass-fed sirloin, and Creed’s Green Irish Tweed aftershave. Why? Because unlike automobiles, they offer a visceral experience: one that requires skill, mental engagement and risk management. On a motorcycle, you can’t sip coffee, fiddle with your phone, or daydream the minutes away. Your senses are on red alert, and your life depends on two tiny patches of rubber connecting you to the road. 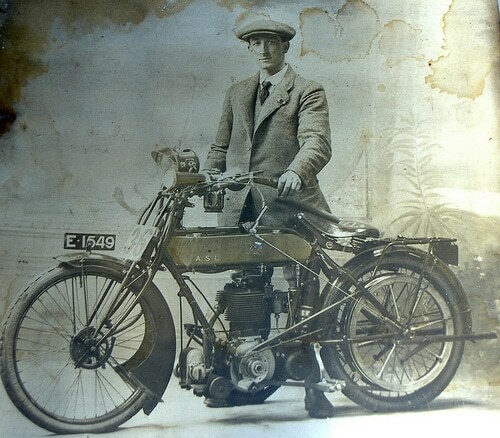 Many guys we look up to are intrinsically associated with two wheels. 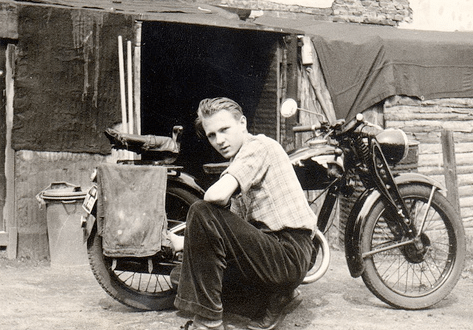 Steve McQueen was renowned for his love of bikes: he was a successful off-road racer, and by the late 70s, his motorcycle collection included well over 100 machines. Marlon Brando rode his own Triumph in The Wild Ones. 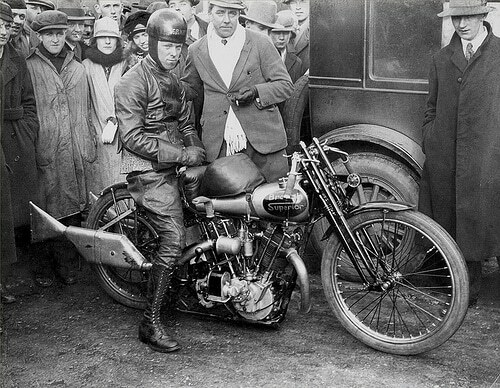 Even “Che” Guevara de la Serna was known for his Norton. Maybe these guys suspected what we’ve just found out: riding a motorcycle makes you smarter, because it taxes your brain. (This has been proved by a scientific study from Tohoku University in Japan.) Or maybe they just rode for the balls-out fun of it. So let’s assume that you’ve passed your test without too much trouble, and you’ve got the co-ordination, balance and presence of mind to ride a two-wheeler. The cash is now burning a hole in the pocket of your leathers, and you’re doing the rounds of the dealerships on a Saturday morning, looking for a road bike. This is what you need to know. Let’s get the bad news out of the way. Most new riders ‘drop’ their first bike, usually during low-speed maneuvering. There are two approaches to this problem. The first is to buy a secondhand bike that won’t cost too much to repair when and if you drop it. The second is to buy a lighter, more manageable bike that you’re less likely to drop. The decision is yours. If you’re mostly riding in heavy traffic or a stop-start urban environment, check how heavy the motorcycle is. (Once you’re moving, weight is less of an issue.) Some bikes regarded as ‘small’ are actually extremely heavy: Harley-Davidson’s smallest model, the Sportster, tips the weighbridge at around 550 lbs. 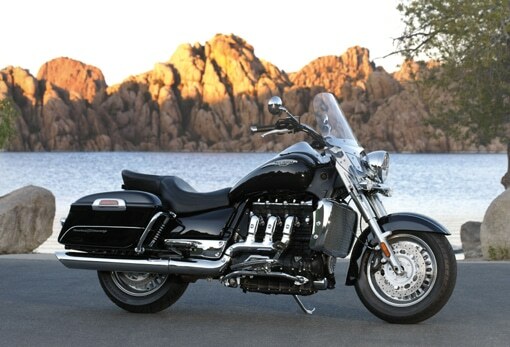 Moto Guzzi’s smallest model, the retro V7 Classic, has a slightly smaller engine but weighs a whopping 150 lbs less. 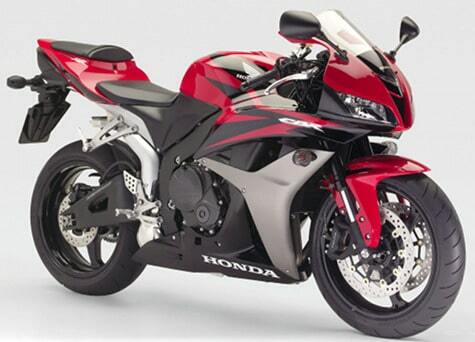 Middleweight sportsbikes, such as Honda’s CBR600RR, will be lighter still. NB: Treat manufacturer’s weight figures with caution. 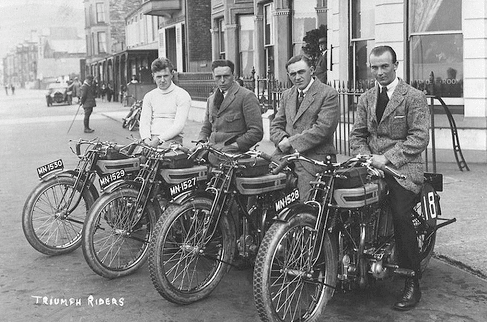 Some are ‘dry’, i.e., minus petrol, oil and associated fluids, whereas others are ‘wet’ and a ‘ready to ride’ weight. The only way to be sure is to try the bike yourself. If you do mostly short trips, sportsbikes are fun. They’re responsive and handle well. But if you ride relatively long distances, sportsbike or ‘café racer’ style handlebars are going to hurt. These bars are low and often slanted downwards, so your wrists have to support more of your body weight. A more upright riding position will take the load off your wrists and hugely increase your comfort level. If you’re doing high speeds, a windshield will make things even more relaxing. This doesn’t mean you need to ride an unattractive bike: cruisers, be they American or ‘metric’, are comfortable over longer distances. And if you like the Euro style, BMW, Ducati and Triumph all make good-looking and extremely competent touring machines. If you’re regularly negotiating city traffic in California, you’ll probably end up ‘filtering’ or ‘lane splitting’. This means riding your motorcycle between two lanes of stopped or slowly moving automobiles. It’s commonplace in most of Europe too. For this quick (if somewhat risky) way of shortening journey times, you need a relatively narrow bike. Medium-capacity (up to around 650cc) single-cylindered machines are good for filtering, and scooters such as Vespas are ideal. Large capacity ‘boxer’ twins with saddlebags or panniers are not. On many scooters, for example, you can store your helmet under the seat. And when you come out of the store, you take your helmet out and put the carrier bag under the seat. 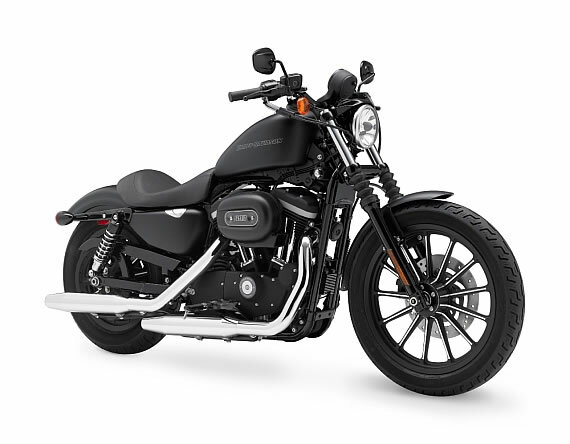 Harley’s supercool, blacked-out Iron 883 has a low seat height of about 25 inches. A dual-sport machine such as Kawasaki’s rugged KLR650 or a KTM enduro is much higher, at around 35 inches. If you can’t get both feet on the ground at the stoplight, you’re going to have problems keeping the bike upright. If the bike has a high saddle but is relatively lightweight, you may be okay with a little lean. If it’s a heavy bike and you’re on tippy-toes every time you stop, you’re in for a stressful experience. So choose carefully, try before you buy, and check to see if the manufacturer offers a low seat option. The good news is that once you’re on the move, seat height becomes largely academic. Even if your bike’s center of gravity is relatively high, you can still have fun in the twisties. Where are you going to park your bike? This is surprisingly important, and something that a lot of folks forget to factor in. The two big issues are theft and cosmetic damage. You can reduce theft to some extent with heavy-duty security measures, but bikes can be lifted into trucks and driven away. And if you’re leaving the bike in public car parks during the day, there’s a risk it will get scratched, bashed, or worse, knocked over. Don’t let your heart get broken: buy a used bike rather than a shiny new one. 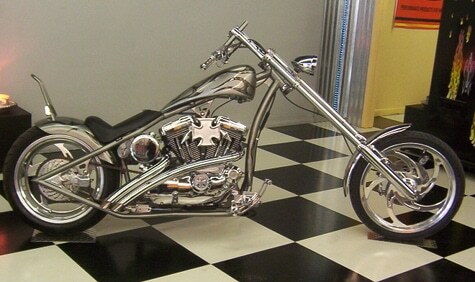 Choppers look bad-a, but they can be tricky to handle. Do you like wearing WW2 German army helmets? Or fringed leather chaps? Men like Jesse James or Paul Teutul, Sr., the boss of Orange County Choppers, can help you here. But one thing to consider about bikes with front wheels that stick out a long way is that most are difficult to ride. 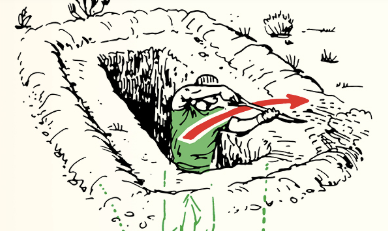 They don’t turn easily, and they’re hard to maneuver in tight spaces. The ‘further out’ the front wheel sits, the less inclined a bike is to turn. The distance between the front and back wheels is another factor: a short wheelbase machine such as the MV Agusta Brutale is designed to respond sharply to small rider inputs. This makes it an exciting ride in short bursts, but hard work over longer distances. Conversely, a long wheelbase cruiser with a fair bit of front wheel rake is going to feel very stable on long, straight roads. Figure out the type of riding you’re going to be doing, and choose accordingly. Then tune up your skills with a copy of Proficient Motorcycling by David L. Hough … and enjoy the ride. Any more advice on buying your first motorcyle? Share them with us in the comments.